"Excuse me?" I asked, as the flight attendant held out a bowl of candies for us. I turned to my wife, two days into our marriage and onboard our flight to Greece, with an inquisitive expression. "Parakalo? Maybe that's the name of the candy, or maybe, it's the word for candy?" When Shilpa was in elementary school, she had a pen pal from Greece. Shilpa was amazed by the photos displayed on each postcard that she received - windows into life in a beautiful, far-off land. Since that time, Shilpa had always wanted to visit her childhood friend's Mediterranean homeland. As a child, I often listened while my father read Greek Mythology to me and my older brothers, great tales of Zeus, Apollo and Artemis, Aphrodite, Athena, Hermes, Echo and Narcissus, and Hercules and Atlas, as well as tales of great battles and epic love affairs. A few years later, my mother took me to a wedding of a friend of hers who was marrying into a Greek family. That was my first exposure to modern Greek culture. Almost two years ago, I bought an 18-month calendar of Greek photos for my then girlfriend. I told Shilpa that I wanted to plan a trip with her to Greece before the calendar ran out of days. 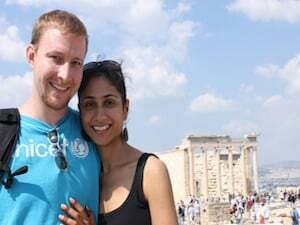 By the end of the calendar, August 2010, Shilpa and I had become engaged, planned our honeymoon to Greece, and were only 11 days away from our wedding day. On September 13, we boarded a plane in Washington, DC, and we began our journey. Traveler's Joy made our honeymoon planning easy, and it afforded our family and friends access to an array of gifts and a range of prices. Many people told us how easy it was to use and how much fun it was for them to look through our choices, our photos, our descriptions. In our planning stages, Traveler's Joy provided guidance by connecting us with several travel guides, including Lonely Planet, right on the website. This included recommendations on lodging, places to see, where to eat, and reviews. Shilpa and I found it easy and fun to set up our registry page. We actually set up another gift registry for those who wanted to give us a physical item for our wedding. However, we found that almost everyone preferred going through Traveler's Joy to help us both fulfill our childhood dreams. We disembarked from the plane a little exhausted from our flight but riding on the adrenaline brought on by the first warm wave of Greek air. We arrived on a sunny day with a bright blue sky and temperature in the 80s, weather we continued to wrap ourselves in for the rest of our stay. Only on our departure on September 25 did it rain. We could not have asked for better weather. From the plane, we hopped on a bus to Syntagma, the transportation hub of Athens. From there, we hopped in a taxi to the hotel. Our driver welcomed us to Greece, asked us about ourselves, and what we would be seeing in the country while on our honeymoon. We found out he had been to Santorini, one of the islands on our itinerary, not once but seven times. "I probably should see other islands in Greece more, but I love it there." Shilpa and I found this encouraging. It had been difficult to choose which of the many islands to visit during our stay. We heard so many good things about several of them, but here was someone who was born in Greece and did not seem to tire of the little, romantic Cycladic island. We pulled up at the front entrance of the Acropolis Museum Boutique Hotel, situated very close to the Acropolis, the new Acropolis museum, the Temple of Zeus, and the historic Plaka, overflowing with charming restaurants, winding streets, and the sound of music in the evenings. The Acropolis Museum Boutique Hotel we actually found through online searches, as some of Lonely Planet's recommendations near the Acropolis were either fully booked or were too expensive for us. From the moment we walked through the door, we could not have been more thrilled with our choice. We were immediately greeted by Donara, who is on staff at the hotel during the day. Donara proved to be one of the best resources in Athens, a guidebook with a warm smile. Our room was what some may consider small but we actually found cozy, and the breakfasts in the morning were enjoyable. Donara and the rest of the hotel staff were very knowledgeable about the area and pointed us in the right direction for delicious cuisine, live traditional music, and the stunning architecture so pervasive in the Athenian landscape. Our first night in Athens took us through the cobbled streets of Plaka and to Scholarhio, "The most Traditional Family Restaurant." The food at the restaurant was decent for a start in Greece. I think that my wife and I agreed that the quality of the food only got better after that first night. So, in comparison, we could have done a little better that first night, but we enjoyed ourselves. What actually captured our attention was the man who greeted us at the restaurant entrance. The two of us were scouring over the menu to see what we could eat. As vegetarians, the two of us are very conscious about picking the right place to eat. I would like to point out here that Greece is one of the easiest countries for vegetarians to visit. Every restaurant we visited offered a plethora of vegetables, cheese, bread, leafy salads, and pasta to accompany our wine or the famous, or infamous, Ouzo. The man who greeted us at the front of the restaurant asked us what we would like to eat. He started talking about the restaurant specialties. We inquired about the vegetarian options, asking if they had anything we could eat. To this, our host responded, "What don't we have?" And that is exactly how we found Greece during our honeymoon - a cornucopia of delicious food. "What don't we have?" You can't argue with that. So, we took a seat. Our first full day in Athens began with breakfast at the Acropolis Museum Boutique Hotel. On the top of our list of sites to see was, of course, the Acropolis, towering over Athens, white marble gleaming in the warm September sun. Admission to this history-soaked landmark is a very small price to pay and includes several other ancient sites throughout Athens. The path that meanders from the base to the summit led us past the Theatre of Dionysos, the Odeum of Herodes, and step by step up to the Propylaia, an impressive entrance to the Acropolis that is lined with both Doric and Ionic columns and forms a glorious monument to the gods. As we walked along the Panathenaic Way, we wandered past the iconic Parthenon, which formerly housed a statue of Athena and is currently undergoing renovations, and the Erechtheion, where it is said that Athena produced an olive tree for the mortals living in the area at the time, giving her victory over Poseidon in a contest for the name of the city. As we sat and gazed at these impressive architectural relics, perched above the surrounding hustle and bustle of present day Athens, I was struck by a marvelous sense of harmony between ancient and modern. The Acropolis is not one of those places merely left to the history books. It lies at the very heart of the city, and the wind that whistles through the fluted columns of the Parthenon is one that both whispers stories from the past and carries the gregarious laughter and pleasantries of modern Greece. Athens is one of the few cities I have visited where a sense of the ancient and of the modern are so intricately woven into the fabric of a culture it so intrinsically defines. After our descent, Shilpa and I went to visit the new Acropolis Museum opened in 2008. This structure is also a marvelous blend of past and present. During construction, excavators stumbled across remnants of ancient Athens. Rather than moving the museum, the lead architect, Bernard Tschumi, found a way to mesh the excavated treasures with a stunning modern design. Elevated on stout columns, the museum was designed with a series of glass floors. Even from the upper levels of the museum, you can see down through these layers of glass to the layers of antiquity that are being excavated even as visitors flow through the doors. Once inside Tschumi's masterpiece, you may spend hours looking through the museum's collection. That day also took us for lunch in Plaka, to the Temple of Zeus and Hadrian's Arch, and to the National Gardens, strewn with flowers, statues, and cool, refreshing fountains. In the evening, we went on our hotel matron Donara's recommendation to the lovely Strofi (www.strofi.gr), one of our favorite places to dine in Athens. Strofi has a delicious fried zucchini and gorgeous views of the Acropolis, which is warmly lit at night. It was at Strofi where we experienced our first Ouzo. This traditional libation has a wonderful licorice-like scent, but don't let it fool you. Ouzo is not for the weak. We also had our first taste of raki, which blew Ouzo out of the water. It seems apt that two of the Greece's traditional drinks would match the strength of the warriors of yore, the armor-laden troops that once launched their ships toward Troy. My wife took one sip of each and was done. After dinner, we took an evening stroll over to the Dora Stratou Theatre, which is known for its summer folk dance performances. We would have loved to experience these traditional dances. We were happy, nonetheless on a September evening, to listen to jazz under the stars in this forest-enclosed theatre, a fitting end to our busy day in Athens. September 16th carried us through other parts of the city, past the Church of Sotira Lykodimou, the Parliament, Syntagma Square, Athens Cathedral, and the adjacent Church of Agios Eleftherios with the nearby statues of Archbishop Damaskinos and Constantine. Of course, we had to take in the sites of the Athens Flea Market around Monastiraklou Square, brimming with fruits, vegetables, and Athenians coming and going. It was here that we were enveloped in one of the more gritty parts of Athens, certainly not as lofty as the archaic sites in Greece but vibrant and lively and flowing with daily activity. Two of our favorite places we visited on this day were the Benaki Museum and the Temple of Hephaestus. A friend of Shilpa's recommended the Benaki Museum to us. Antonis Benaki's private collection includes pottery, intricate woodwork, and Greek dress from different regions and periods, all housed in what was originally the Benaki family home. The Temple of Hephaestus, located on the edge of Ancient Agora, was built to honor the god of the forge. As Lonely Planet states, it is the "best-preserved Doric temple in Greece." Despite the fact that the Temple of Hephaestus is not perched high on top of the Acropolis nor displayed quite so dramatically, it is well worth a visit. The temple affords you a sense of what the battle-torn, looted, and timeworn Parthenon must have looked more like in its full glory. From the entrance to the temple, you can, in fact, see the Acropolis towering high in the distance. With fewer tourists swarming the area around the Temple of Hephaestus, you may find it easier to enjoy moments of contemplative solitude. In the evening, we once again took Donara's advice in our search for a restaurant with live Greek music. Our friend pointed us in the direction of Plaka, to Mostrou, a lovely restaurant with an outdoor courtyard. Warming ourselves in the evening air and enjoying the food and drinks, we soaked up the atmosphere as we listened to a pair of men playing Greece's world-renowned rembetika music. As one of the musicians played the guitar and the other played a bouzouki, the guitarist charmed us with his melodious vocals. Greek food, Greek music, Greek charm. It did not take long to feel at home, and as we nestled into bed that evening, we dozed off to the gentle strumming of the bouzouki and the hypnotizing vocals still lingering in our ears as they serenaded us into sleep. The following morning, we took the metro to the airport and boarded Olympic Air for the next stage of our honeymoon, to the island of Naxos. Shilpa and I chose Naxos for several reasons. One of the reasons was the island's proximity to Santorini, the third stage in our vacation, and to the island of Delos. All of these islands are part of the cluster of islands known as the Cyclades. Kyklos, in Greek, means circle. Santorini and Naxos are two of the islands that form a circle around Delos, an island rich in archaeological history. 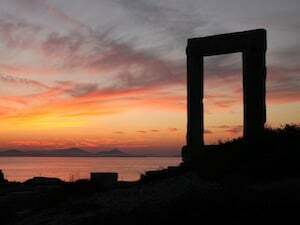 Another reason we chose Naxos was based on the description in Lonely Planet. "The island was a cultural centre of classical Greece and of Byzantium. Venetian and Frankish influences left their mark. Naxos is more fertile than most of the other islands and produces olives, grapes, figs, citrus fruit, corn and potatoes. Mt. Zeus (1004m; also known as Mt. Zas or Zefs) is the Cyclades' highest peak and is the central focus of the island's mountainous interior, in which you find enchanting villages such as Halki and Apiranthos. There are numerous fine beaches and the island is a wonderful place to explore on foot, as many old paths between villages, churches and other sights still survive." The descriptions of the island were enticing, and we were not disappointed. For our stay on Naxos, we had reserved a studio apartment for 3 nights at Oasis Studios located in Mikri Vigla, which can be found on the eastern coast of Naxos, south of both the airport and the port. The owner, Salteris Emmanouel, helped set up a rental car for us through "Auto Tour" which had a representative waiting for us at the airport with the car on our arrival. From there on, through the rest of our stay on Naxos, our only regret was that we did not stay longer and spend more time exploring the island. Once we arrived at Oasis Studios, our host and his sister welcomed us warmly. We settled into our room with a view of the sea, and over an afternoon drink, Emmanouel laid out the possibilities for us during our stay on the island. He told us so much about the history of the island, the highlights of Naxos, the places to eat, and helped us reserve a day trip to Delos and Mykonos (as he also runs a local travel agency - www.viglatravel.com). Shilpa and I found Emmanouel extraordinarily helpful and friendly. Our bed at Oasis was a little uncomfortable, honestly, but we found this family business a delightful choice for those who seek a quieter location for a beachfront respite. Our first day was spent mainly relaxing, exploring, and picnicking on the beautiful beaches of Mikri Vigla, which "translates as 'little lookout', a watching place for pirates, and reference to the rocky headland, all golden granite slabs and boulders, between superb beaches" (Lonely Planet). The water at Mikri Vigla, depending on the time of day, captures the eye with an array of colors ranging from a silvery shimmer during sunrise to a mid-day Caribbean green to a deep blue in the evenings. If you enjoy windsurfing or kite boarding, the Meltemi wind off the northern point of Mikri Vigla makes this an ideal spot for water sports. For dinner, we walked over to the nearby Kontos. The food at this restaurant is locally grown, and it was from the outdoor terrace that my wife and I saw one of the most amazing sunsets during our travels in Greece. As we dined, we watched as the sun slowly set over the Naxian sand dunes with a gentle breeze blowing through the long blades of grass, the magnificent Aegean Sea, and the neighboring island of Paros with its 770 meter high Mt. Profitis Ilias in dramatic silhouette. Later that evening, from our balcony at Oasis Studios, we could see the twinkling lights of nearby seaside villages, and we could hear the gentle lap of the water against the shore, a soothing sound as we prepared for our first night's repose in Naxos. The next morning took us from the beaches to the highest peak on Naxos and in fact all of the Cyclades, Mt. Zas, which stands at 1,004 meters. We hopped in our Auto Tour rental, and as the road wound its way over the landscape, bespeckled with blue- and green-crowned bright white Greek Orthodox churches and pottery shops, we passed through quaint hillside villages on our way to the mountain. Once we parked the car, we began our trek up Mt. Zas. The mountain consists of very rocky terrain. So, I would advise bringing good boots for this hike. At the base of the trail is a cool mountain spring, Aria, very refreshing before and after a long hike. It was a little hazy for our hike, but you will still find some amazing views of the island and surrounding Aegean. We heard from Emmanouel that, on clear days, you can see other outlying islands within the Cyclades. We spent some time at Zas Cave, an impressive cavern located on the slopes of Mt. Zas and penetrating deep into the side of the mountain. The cave provides welcome shade on the otherwise sunny slopes. Following our hike, Shilpa and I drove our little rental to the charming little community of Halki, known for its production of kitron, a liqueur made from grape skins and citron leaves, and for its quaint ceramic and textile shops. L'Olivier, one of the most well-known in Halki, has some beautiful, artistically crafted ceramics with a particular emphasis on fish and olives, and a nice selection of fresh olive oils, perfect for a family gift or for your own home, laced with a hint of nostalgia. One of our favorite shops in Halki was a hand-woven textiles store owned and operated by Maria Maraki, a weaver since 1960 and a lovely woman who uses the loom to craft her products. Her crafts are a mixture of Greek and the more locally based Naxian colors and styles. During our visit, Maria sat my wife down at the loom with her to show her the art of weaving, as Maria skillfully sent the shuttle back and forth from one end of the loom to the other. We left Maria's shop with a couple of draw-string pouches filled with amazing, fresh oregano, a Naxian table runner, and smiles on our faces. For lunch, we ate in the courtyard of one of the centrally located tavernas, partially shaded by a network of grape vines. With clear blue skies and brilliant sunlight filtering through the vines, Shilpa and I dined in style as we recuperated from our late morning hike. For dessert, we ordered a stemmed glass of yoghurt and honey, both locally produced. If you've ever wondered what ambrosia, the food of the gods, tastes like, go to Naxos for a dish of their yoghurt and honey. I had never before tasted anything that rivals this Naxian specialty, and I can understand now, after tasting Greek honey, precisely why the gods drink so much mead. We woke up early on September 19 to a shimmering, silvery hue on the water, with the first rays of the sun sparkling on the surface. We had bought our tickets from Emmanouel for a Panteleos Cruise. We hopped in our car, armed with my new Canon Rebel T1i, and drove to the island's port and capital, Hora. From there, we boarded the Naxos Star for a day cruise to the neighboring Cycladic islands of Delos and Mykonos. Delos and Mykonos are intrinsically different islands, though very close in proximity. Delos, the center of the Cyclades, nostalgically clings to the past while Mykonos swells with modernity. Delos has no permanent inhabitants while Mykonos can be filled with throngs of tourists and intermingling locals. Delos is spread out and brimming with archaeological treasures; Mykonos can be characterized by its heavily populated beaches, winding streets, trinket shops, and from what we heard, some of the best night life on the islands. Delos affords you a sense of peace, of sweet solitude, as the gentle breeze filters through the statues, columns, and chambers of days gone by, carrying with it a faint whisper of all the great oral traditions, passed down through generations. The air in Mykonos is warmed by laughter, by frivolity, by a bustling exuberance that runs rampant, much like a group of children excitedly winding their way through the cobblestoned alleyways and sneaking a trinket or two from the unamused shopkeepers. We spent three hours on each of these islands. We first visited Delos, known as the birthplace of Apollo and Artemis. There is a 5 Euro fee for Delos, a small price to pay to wander among sacred remnants of a place where people in the 8th Century BC once tread. It is here you can see the two-storied House of Hermes, the House of the Trident, the Sanctuary of Dionysos, the Stoa of Poseidon, the Temples of Apollo and Artemis, a theatre, and the renowned Terrace of the Lions. The island also has its own museum, where it preserves the original lions and many of the other discoveries from around Delos. The island is dripping with archaeological finds, and the beauty of the birthplace of Apollo and Artemis is astounding and humbling. We hopped back on the Naxos Star and went for a short ride to neighboring Mykonos. As we pulled into the harbor in Hora, we noticed first the bright white walls of the Church of Panagia Paraportiani. The glowing church serves as a beacon, calling travellers to the island's rocky and sandy shores. A short distance from there is a row of windmills. With five majestic windmills, the sight was enough to impress the most disgruntled traveller and to make even the great Don Quixote quiver in his boots. The two locations on the banks of Mykonos make for the most picturesque, with marvelous views of the cerulean Aegean. Shilpa and I also walked past the packed harbor beach, a red-roofed church, and wound our way through the maze of traditional alleys, swelling with excitement, intermixed with brief moments of quiet. Many of the shops are heavily geared towards tourism. The capital is also filled with waterfront cafes and back-alley bars and clubs. We did not spend enough time in Mykonos really to get a good feel for the day-to-day life. A couple of our friends had previously stayed in Mykonos, and they thoroughly enjoyed their experience. 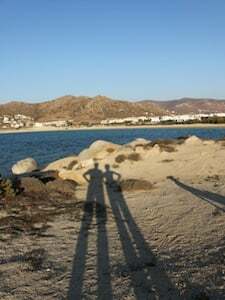 On our return to Naxos, we arrived to what was the most spectacular sunset of our honeymoon. The colors intensified to vibrant hues of flames. The sky was ablaze. Shilpa and I were spellbound. The two of us climbed up the short, gradual slope to the Temple of Apollo, which sits adorned with a large stone doorway, called the Portara. This impressive structure, looming over us, stood in stark contrast to the fiery evening display. The beauty that surrounded us that evening was truly unparalleled. It is one of our most cherished memories from the trip. The following morning, we arose early again, checked out of Oasis Studios, drove to the port, returned our car, and boarded our Highspeed 5 Hellenic Seaways ferry bound for Santorini. Santorini was the one island Shilpa and I knew we wanted to visit from the beginning of our travel planning. Several friends urged us to visit the island, and many of the beautiful photos from our calendar were taken in Santorini. We had heard it from several people that it is one of the most romantic islands in Greece, and we were glad that we listened. Santorini's current shape was formed by volcanic activity. Originally, the island was round, like many in the Cyclades. In fact, its former name was Strongili, meaning "round one". However, "in about 1650 BC a colossal volcanic eruption caused the centre of Strongili to sink, leaving a caldera with high cliffs - now one of the world's most dramatic sights" (Lonely Planet). Volcanic activity has reshaped the island several times and left behind the magnificent cliffs that define Santorini. As our ferry arrived in the port, we stood in awe in the shadows of Santorini's towering cliffs. As we disembarked, we were met by a representative from Santorini Car Hire. Admittedly, we were a little taken aback by the fact that the representative rather nonchalantly informed us that there should be enough gas in the car to make it up to the top of the steep, winding road to refuel. Our car in Naxos was also in much better shape. Santorini Car Hire provided us with a vehicle that was functioning, but I cannot earnestly tout them more than that. It served us well enough during our stay, though. We had booked our stay in the town of Fira at a charming boutique hotel called Aroma Suites. A little off the beaten path and quieter than the rest of Fira, Aroma Suites is comfortable, with beautiful views and excellent staff. We went with Aroma Suites based on its location, because it is listed as one of Lonely Planet's top picks, and after reading all the praising descriptions we found online. Aroma has traditional caldera interiors, cozy caves built into the edge of the cliffs. We stayed in the honeymoon suite during the course of our stay, which was outfitted with a Jacuzzi of our own. Aroma's owners and staff were very helpful and cordial, making our stay most enjoyable. We relaxed for a short period, taking in the views, reading, talking with a couple of honeymooners from Australia, and sipping on cool beverages. As we wrapped ourselves in the Santorini breeze, we occasionally heard the sound of bells in the distance. We came to find out that these bells are placed around the necks of the town donkeys, which are used to transport people from the old port, Fira Skala, to the top of the caldera and back. For a small fee, tourists ride their own donkey up and down the cliffs, and it is the sound of the bells that filters through the alleys into every nook and cranny. For lunch, we were pointed in the direction of the nearby Ellis, where we ate a couple of times while in Santorini. Like many restaurants on the island, Ellis clings to the upper fringes of the caldera, with an amazing view of neighboring islands bathing in the Aegean. At Ellis, we experienced some of our favorite food on our travels. One of these favorites was a local white eggplant stuffed with tomato and buffalo mozzarella, coated with mouth-watering lavender sauce. We also had some Santorini fava and a delicious phyllo-wrapped cut of Halloumi cheese, topped with honey and pistachios. The food at Ellis speaks for itself, and as with many places in Greece, we were given a free, welcoming drink. There are many good restaurants in Santorini, and the lights at night decoratively bedeck the crown of the caldera, as the evening breeze scurries through the alleys. And the reflection of the moon and stars overhead dance on the surface of the dark waters below, while star-crossed lovers gaze into each other's eyes and the sounds of music pluck at the strings of the romance so pervasive on this small Grecian gem of an island. On September 21, we had a tasty breakfast on one of the balconies at Aroma Suites. Later in the day, we went for a relaxing excursion to Spa of the Gods, which is located above the main port. Though the name may seem just a little lofty, a smooth scintillating milk and honey massage makes it a little easier to understand why the choice in name. As you lie prone in a cozy cavern chamber with warm milk and honey being lathered all over your body and with the sweet smell of heaven filling your lungs with every breath you take, the thought of calling in sick for a couple more weeks may just cross your mind once or twice. That same day, we also ventured out to a lovely little crêperie called NRG. Though small in size, the sweet and savory crêpes are delicious. One of the owners, Ingela, was originally from Sweden but has lived in Santorini for 15 years. She brought her grandmother's crêpe recipe with her, and her knowledge of Santorini is invaluable. Ingela suggested we visit a couple of her favorite places during our stay, which we did the following day. One of these two places Ingela recommended, Exogonia, is located south of Fira and closer to the center of the island. There is not much to see in Exogonia, as some of the houses have been abandoned. However, that is precisely why we went. Ingela told us of these old traditional-style buildings that had been left behind long ago. It took us a couple of tries to find the right location. However, once located, we meandered around and through a couple of these stone structures and took some captivating black and white photos, freeze-frames of history, partially preserved and partially fading into the landscape. Following our stroll through Santorini's past, we drove to the nearby Art Space, Ingela's second recommendation. Art Space is a fascinating blend of art gallery and winery. In underground caves, you will find a tastefully displayed gallery of local and international artistry. Within the confines of Art Space, you will be led through a series of tunnels and chambers on tour of the old and new distilleries. The tour guide will walk you past all of the pre-industrial processing installations; the vertical mode, gravity-flow installations of the modern distillery; the French barrels; the temperature controls; and finally to the tasting room where, for a reasonable price, you may taste the island's specialties - Vinsanto wine and the local raki. From there, we toured more of the southern end of the island, around Ancient Thira, Perissa, and the Red Beach, before heading north past Fira to the town of Oia. Oia is a prime location for sunsets, one that Lonely Planet claims "gets more sunset time than Fira." One advantage we noticed is that Oia's electrical lines are buried, unlike Fira and other parts of the island. This leaves an unobstructed and highly prized view of the longest sunsets in Santorini. Oia is a very picturesque town, filled with white-walled dwellings, blue-domed churches, and family-owned businesses. The sunset from Oia was not as dramatic as those we'd seen in Naxos, but it was nevertheless one of grace and beauty, framed in many spots along the walls by white and pink bougainvillea. From there, we wound our way down the stairs to Port Ammoudi for dinner by the sea. Many of the island's fishermen return here partly to stock the restaurants lining the docks. As we dined and looked out at the boats rising and falling on the swelling surface of the sea, one small boat caught our eyes. On the stern of the boat, in large bold letters, were painted two words - "Why Not." This phrase, "Why Not? ", we had heard several times on our trip. "May we have another drink?" ...... "Why Not?" ...... "May we see a dessert menu?" ...... "Why Not?" ...... "May we sit on the balcony with a view?" ...... "Why Not?" In fact, this simple phrase echoes throughout Greece. Every wish of ours, every dream, seemed to be met with a warm, welcoming smile and, whether spoken or implied, these two simple words. Wherever we went, this basic response to life's many questions, this overwhelming display of affection for visitors, seemed to bind the people of Greece together and endear them to guests from many foreign lands. Though Greece has recently been going through a deep recession and some political turmoil, I believe that this attitude, as it has in the past, will continue to sustain the Greeks. The people we met on our travels won our hearts with gregarious charm and open arms. If you should ask, "Why Greece? ", I'd have to respond simply, "Why Not?" Our final, full day in Santorini began with a second visit to our favorite crêperie, NRG. We thanked Ingela for her recommendations and her delicious crêpes. 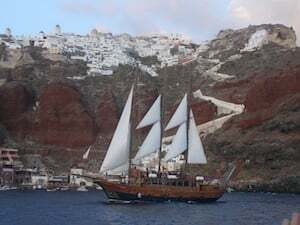 Then, we made our way down the stairs from Fira to Fira Skala, where we boarded the Bella Aurora for a trip to the Nea Kameni volcano, the hot springs, and a sunset cruise around the northern end of Santorini. This cruise around the islands of Santorini the staff at Aroma Suites booked for us through Sunset Santorini Tours. Nea Kameni has just a few planted trees. Otherwise, the volcanic island, dormant since 1950, is a conglomeration of dark black rocks, deep red ones, and strips of yellow here and there, left by the sulfuric steam that rises out of air vents near the rim of the Mikri Kameni crater. This island stands in stark contrast to the rich Mediterranean green of other parts of Greece. The combination of rocky terrain, deep craters, and hot steam are humbling and really makes you ponder your own mortality. Nea Kameni makes quite an impression. The Bella Aurora made one more stop at the nearby hot springs for those who chose to swim through the cool, refreshing waters of the Aegean to where they meet the warm spring waters of Nea Kameni. Afterwards, the ship's crew fed us, gave us Santorini wine, and guided the vessel around Thirassia and on to waters just off the coast of Oia. There, the crew set the sails as the sun set in the sky, and music and dancing commenced. In the cool, evening air, our spirits were lifted as we basked in the warming glow of Greek culture. As we glided along beside the cliffs of the caldera on our return to the old port, the moon cast a reflection on the surface of the sea, and I could see a glimmer of the moonlight in my wife's eyes. We pulled into Fira Skala, disembarked, and Shilpa and I made our way towards the cable cars that daily speed up over the rocky slopes to Fira. We ate out under the glow of the moon and stars, and we slept soundly that night, as the sea lapped at the shores of Santorini and as the breeze rustled through the leaves in the trees and brushed past the door of our traditional caldera suite. The next morning, we dropped off the car at the airport and boarded Aegean Airlines. A short flight and metro ride returned us to Athens for the final night of our honeymoon. Hera Hotel was much fancier and more spacious than the Acropolis Museum Boutique Hotel, but, in all honesty, we missed Donara and the other pleasantries of the smaller hotel. We spent the day shopping in Athens, searching for gifts for our friends and families and memorabilia for ourselves. One of our favorite shops was run by a couple of pottery makers, Sofia Gani and her husband Dimitri Stefanou. They were a very charming couple, and their handmade crafts, all part of SJS Designs, covered traditional and modern designs, simple and intricate, all very beautiful. That evening, at Hera Hotel's Peacock Restaurant, we dined on the rooftop terrace with a lovely view of the Acropolis and Acropolis Museum. The meal and service were pleasant, and the nightlit Acropolis was enchanting. We, of course, had to top it all off with yoghurt and honey before retiring for the evening. After breakfast the next day, September 25, we boarded the plane aimed for home. As the flight attendant came around with her candy, she offered us one. "Parakalo." In Greek, "parakalo" means both "please" and "you're welcome." Flight attendants, like the servers in restaurants around Greece, often say "parakalo" as they give you food or a free drink. The usual response is "efkharisto", which means "thank you." Only a few days later, I was getting my hair cut in Washington, DC's Dupont Circle. I happened to be seated by a young barber of Greek origin. The two of us talked about the honeymoon and his life in both Greece and America. Not surprisingly, his nature was warm and gregariously charming. After he finished and I had paid, I said "efkharisto". He smiled, shook my hand, and replied "parakalo." 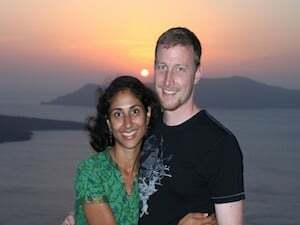 Shilpa and I will never forget our honeymoon in Greece. We will never forget the food, the beauty, the culture, and the artistry. Nor will we forget the smiles, the laughter, and the everyday kindness that knocks on your door to greet you in the morning and tuck you in at night. To all of our friends and families, to Traveler's Joy, to Lonely Planet, and to everyone in Greece, thank you for making our dreams come true. From the bottom of our hearts, efkharisto.